Explore the Cockscomb along Cottonwood Canyon Road. This description begins at the southern trailhead marked by a sign across the road from the parking lot. Immediately after leaving the parking lot, the trail drops into the streambed and heads for the obvious canyon mouth directly ahead. Soon after entering the canyon, the trail bears to the right and you quickly reach a rock fall (almost a pour off­) that blocks the streambed. A faint trail on the right side works its way over the rocks and then back to the streambed, which is flat and filled with soft sand stretching from wall to wall. 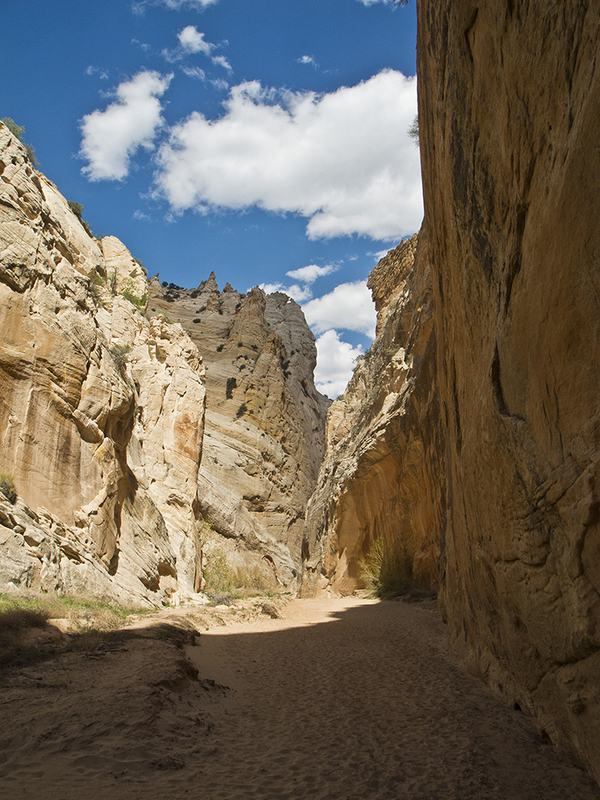 The canyon widens considerably, and about three-quarters of a mile from the trailhead, the mouth of a narrow canyon appears in the left canyon wall. This short canyon is worth poking into, and can be shady and cool on a hot day. 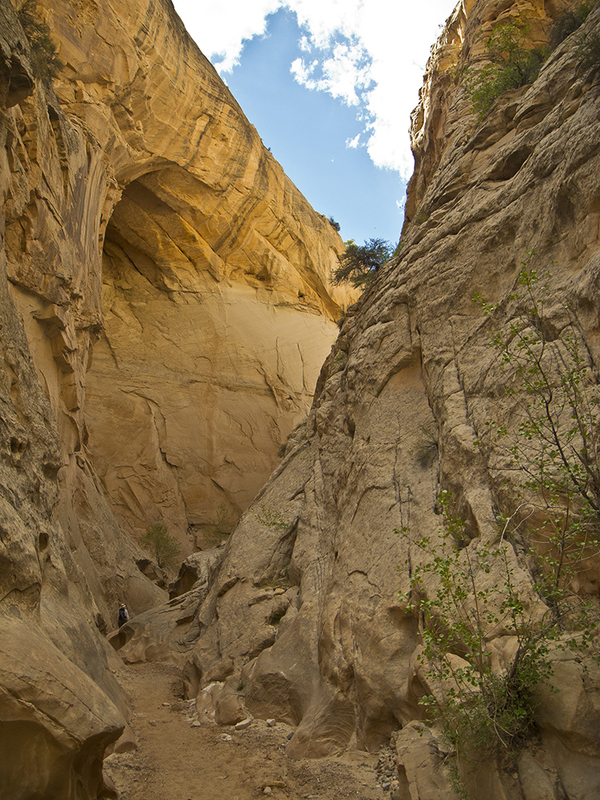 The trail continues along the streambed below sandstone cliffs streaked with desert varnish and topped with some gargoyle-like formations. At about 1.75 miles, the canyon narrows and there is some nice fluting caused by sediment-laden water rushing between the narrow sandstone walls. When the canyon hooks to the right and opens up a bit, you soon reach a large boulder and small rock jam in the middle of the streambed that can easily be passed on the left. In a few hundred feet the main canyon goes right, and a slot canyon appears on the left just before the trail emerges from the canyon to return to the Cottonwood Canyon Road. 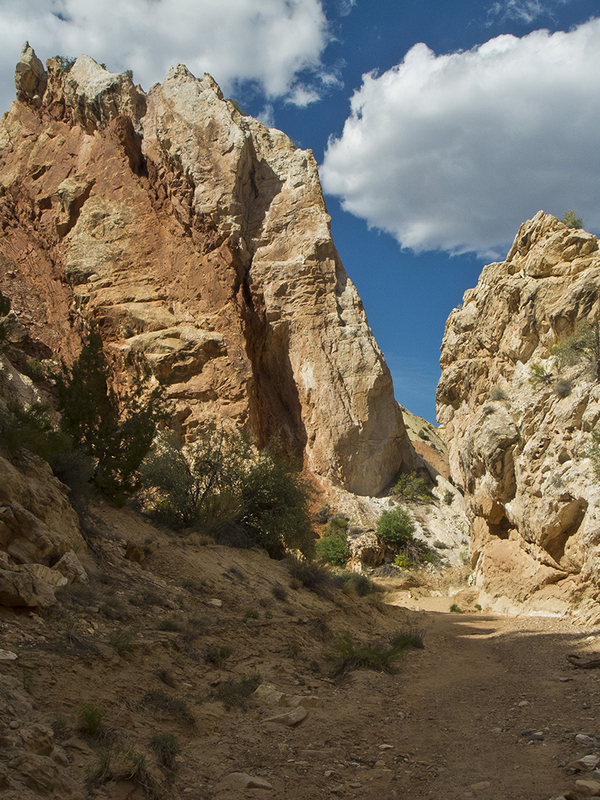 This twisting, narrow slot canyon continues up Cottonwood Creek to Butler Valley Draw, is passable for quite a distance, and is worth exploring. When you reach the Cottonwood Road, you can either hike south along the road to your vehicle, or return back down the canyon the way you came. 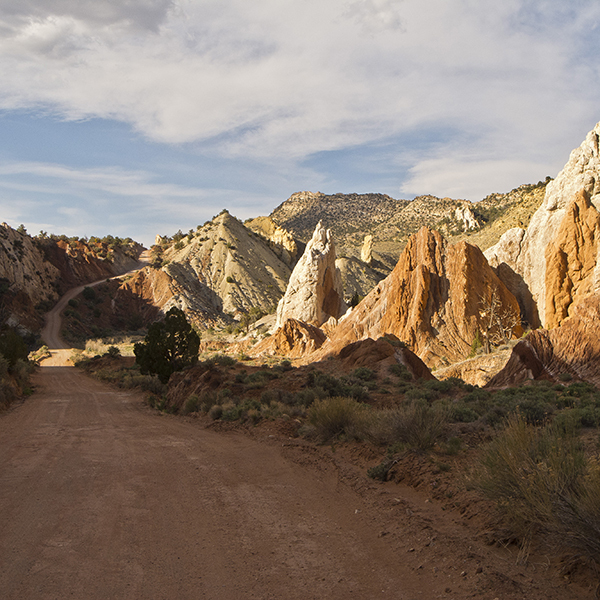 Take the Kodachrome Basin road about 22 miles south from Cannonville, UT, which is located on UT 12 about 12 miles southeast of Bryce Canyon NP. The trailhead is on the right side of the road near the southern mouth of Cottonwood Narrows. This hike can also be done from the north end of Cottonwood Narrows. If you prefer to hike the canyon from north to south, look for a gap in the rocks on the right side of the road at the bottom of a steep hill about 20 miles from Cannonville. 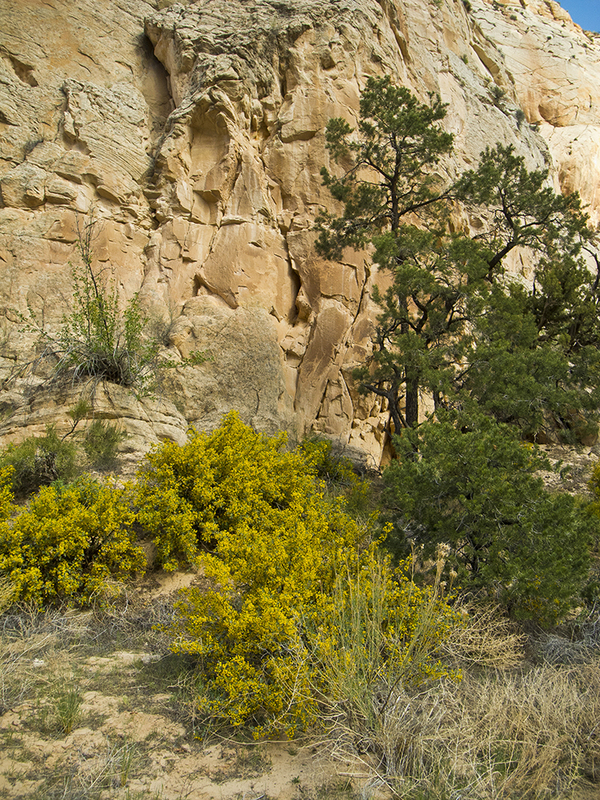 The southern trailhead can also be reached from US 89 by traveling about 25 miles north on the Cottonwood Road, which meets US 89 about 46 miles east of Kanab or 26 miles west of Page. Note: Though the Cottonwood Canyon road is graded dirt, it crosses some areas with clay soils that can make it impassable with even small amounts of rain or snow. It can also be very rutted. No fee – Free permits are required for overnight use, and groups are limited to 12 or fewer. Check the website listed below for current information.